The work was carried out in extremely uncomfortable conditions, from his having to work with his head tilted upwards. fallen backwards in my head! they’re just dancing by themselves! my back is tauter than an archer’s bow! Picture Researchers: I don't know who owns this drawing. Wikipedia treats it as Public Domain on the basis of its age, but presumably it's in some collection and maybe there's copyright in whoever took the photo of it, or something. Can you find out? If it's very expensive then the question probably works OK without it. You might also look for a still of Charlton Heston as Michelangelo in The Agony and the Ecstasy, painting whilst lying down - in fact this might be a more useful image for our purposes. ... although I actually can't think what the question ought to be. Anyone? Also: is the Gen Ig still current on this, or is this misapprehension peculiar to people who were around when the film came out? I suppose the question is something along the lines of "How did Michelangelo paint the roof of the Sistine Chapel?". I knew the answer though. Is it only from The agony and the ecstasy that one might get the idea that he lay on his back? Flash's second question appeared while I was writing - possibly it is. I wasn't born by 1965 when the movie came out, although I wasn't far behind - and if I'd been asked the question as I phrase it here I'd have given the correct answer. A quick look around the web confirms that many sites do still affirm that he lay supine to paint (one even says that he lay prone, but I attribute that to a defective vocabulary). None of them gives a source (which I suppose is to be expected, since it isn't true) so I can't tell whether the idea predates the book & film. How was M lying when he painted the ceiling? A: He claimed to be using Farrow & Ball premium-grade 'Dawn Blush' emulsion but it was actually Dulux economy range off-white. Any onlooker fleetingly imagining they spotted a human brain in the flurry of cherubs and drapery swirling around the figure of God as he stretches out a hand to raise Adam to life in Michaelangelo's famous fresco from the Sistine Chapel would probably conclude there was some malfunction in their own brain. However, four eminent scientists are convinced the swirls are not meaningless decoration, but a transverse section of the sagittal section of a human brain. 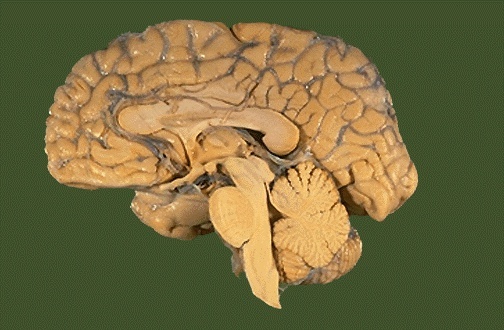 The resemblance to a brain was first suggested by another scientist, FL Meshberger, but now Alessandro Paluzzi, Antonio Belli, Peter Bain and Laura Viva, from the neurosurgery, neurosciences and radiology departments of James Cook university hospital in Middlesbrough, Teesside, Charing Cross hospital in London and Southampton University, have dissected his theory and tracked down more brains in masterpieces by other Renaissance painters. 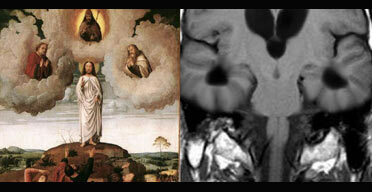 "The idea came to me while looking at Raffaello's Transfiguration. Being a neurosurgeon I could immediately see a brain in the painting," Paluzzi said. Partly as a joke to entertain sceptical colleagues, he and the team went on a brain trawl, and found many other examples. The team is convinced the artists were fascinated by the scientific discoveries being made by anatomists, but their theories had to be concealed in the imagery of their paintings, particularly when their clients were so often senior clergy who might see their scientific interests as blasphemous or even heretical, an offence punishable by death. The study, Brain imaging in the Renaissance, features in the Journal of the Royal Society of Medicine. Picture researchers: look at the first two paras of the quote and then we'll have a chat to see what we can do with this. Panel from Sistine Ceiling showing God Separating Earth from Waters (1511) by Michelangelo (a). Computer-assisted removal of the figures showing kidney shaped mantle of the Creator (b). Color highlighted version of (b) to demonstrate the vessels and ureter of the kidney (c). Reproduction of a medical illustration of the normal kidney (d) in which the ureter is shown in its normal course downward from the kidney. In the figure by Michelangelo, it is likely that the ureter is shown extended below the kidney and protruding at the left upper corner beyond the outline of the mantle (a). That would be the position of the empty ureter if the kidney were hurled at the viewer or traversing at high speed through space. Q: How was Michelangelo lying when he painted the Sistine ceiling? A: He was pretending not to know what a dissected human brain looks like. Ugh - I'm not keen on that. It all seems a tad theoretical to me - humans are pattern-making creatures and it seems a stretch to go with a question when neurologists might see brains and urologists see kidneys and the actual evidence is less than definitive. The bit about whether he was standing or lying seems worthwhile to me - I had always thought he was lying, but then I saw the movie donkeys years ago. ... or possibly vice versa. I'm with Jenny on this one. These people have obviously spent far too long staring at brains. Given how complicated an organ the brain is, I'm sure you can cut it in a variety of ways to produce almost any kind of shape you like. They'll be producing clear evidence of brain patterns in Dr Seuss next. It might be an interesting theory to put forward for the panellists to have a bit of a chuckle with, but it should be stressed that this is just a theory of a minority of neurologists, rather than implying any fundamental truth to this idea. A couple of points about Michaelangelo & the Sistine Chapel. Condivi asserts that Michaelangelo suffered a bizarre form of eye strain as a result of his peculiar working position. He could only read letters or look at drawings by holding them at arms length above his head. This condition persisted for many months and must have made sketching hard. The reason that Michaelangelo was asked to paint the ceiling in the first place is because the Sistine Chapel was unstable on its foundations and subsidence had caused the previous ceiling (by Piermatteo d'Amelia) to crack and fall away. Sadly the chapel's structural defects were not solved until after Michaelangelo's death and continued to cause problems. In particular the tips of Adam's index and middle fingers fell off. Those we see today are not the work of Michaelangelo at all; however no-one has ever heard of Domenico Carnevale from Modena who was given the task of plastering over the cracks and touching up the damaged fresco! For the picture researchers: The manuscript with the sketch of Michaelangelo painting is in the Archivio Buonarroti in Florence. I will also pass on to Flash a copy of a sketch in the corner of one of Michaelangelo's drawings from the Uffizi which shows the scaffold and a figure on it. It's probably too obscure, but I think I could dig up some stuff about Michaelangelo using cheaper pigments. Ultramarine was as valuable as gold and was made by crushing lapis lazuli - a naturally occuring blue rock only found in Afghanistan and Chile - and was much prized by Michaelangelo's contemporaries. He seems to have used remarkably little on the ceiling though. On another tack, ultramarine (or azzurro ultramarino as the pigment was called) does not get its name from "the deep blue sea" rather as the 'blue from beyond the sea' i.e. Afghanistan. no-one has ever heard of Domenico Carnevale from Modena who was given the task of plastering over the cracks and touching up the damaged fresco! Unless they watched the E Series of QI, that is.